The classic Elizabeth Arden Red Door Spas has introduced five new skincare and beauty services ranging from facials, Keratin hair treatments and new nail and waxing treatments. In honor of Ms. Arden’s visionary philosophy that beauty should be “an intelligent union of nature and science,” each new treatment combines powerful ingredients and cutting-edge techniques for a results-oriented approach to beauty. I had the chance to experience the Ultimate Arden Facial, mixed with an oxygen treatment at the New York City flagship spa on 5th Avenue. After cleansing and exfoliating, my therapist went on to moisturize my hands and cover them in plastic and gloves for an intensive hand treatment. In addition to Red Door Spas’ proprietary organic flower peel microdermabrasion, the Ultimate Arden Facial also includes a soothing milk and honey face and eye collagen mask with marine bio-extracts and a skin-firming décolleté treatment. And, it doesn’t stop there; I received a warm stone upper body massage while my skin soaked up the nutrients from the treatment, and my therapist also applied a steady mist of pressurized oxygen to get deep into the cellular levels of my skin. While I opted to leave with a freshly cleansed and treated face, the Ultimate Arden Facial also comes with a personalized Elizabeth Arden makeup application at the end, for those with places to go and people to see after the treatment. Here are some more details on all five of Red Door’s new skincare and beauty services! This newly redesigned, multi-faceted facial combines innovative technology to deliver visible results, paired with a warm stone upper body massage and intensive hand treatment. Skin is renewed with Red Door Spas’ proprietary organic flower peel microdermabrasion (or lactic acid peel), and then nourished and toned with a soothing milk and honey face and eye collagen mask with marine bio-extracts, and a skin-firming décolleté treatment. 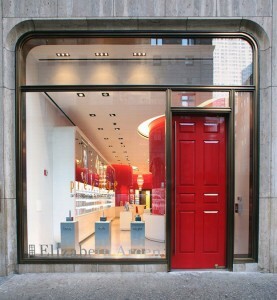 Complete this facial with a personalized Elizabeth Arden makeup application. Suitable for all skin types. Offering the latest innovation in skin regeneration with oxygen, an essential element that dramatically revives and replenishes skin cells, this facial provides a one-two punch of oxygen and collagen to deeply rejuvenate skin. Treatment begins with the application of a specially formulated collagen serum to promote elasticity and firmness. Next, a steady mist of pressurized oxygen, delivered deep into the cellular layers of the skin, provides an immediate plumping effect. The concentrated application of oxygen and collagen revives skin, resulting in a complexion that looks fresh, radiant and glowing. Suitable for all skin types. Service only available at New York, Chevy Chase, Chicago, Garden City, Wildwood, Gaithersburg and Cross Keys. This one-hour in-salon service reduces frizz, curl and styling time for up to six weeks and can be washed out the same day. Trionic keratin protein and a co-polymer delivery system deliver high-quality keratin in a short amount of time, leaving hair smooth, silky and more manageable. Suitable for all hair types, including color-treated and previously relaxed hair. Soothe tired hands and feet with a sugar scrub exfoliation treatment followed by a moisturizing massage of rich body crème infused with vitamin-rich grape-seed oil. A warm paraffin treatment seals in moisture and provides complete hydration, leaving you renewed and relaxed with silky smooth skin, and nails and toes freshly polished. Ms. Arden’s renowned, proprietary beeswax formula has been updated and enhanced. Formulated with natural fruit extracts of acai berry, red raspberry and red currant, which offer anti-inflammatory healing benefits and a powerful source of antioxidants to nourish and replenish skin. The red formula exhibits anti-inflammatory and skin-soothing properties and is infused with a soothing rich berry scent. Suitable for all-over hair removal, including Brazilian bikini waxing, and leaves skin replenished, silky-smooth and supple. *Prices listed are for New York City Flagship. Prices may vary by location.